We are engaged in offering Tuplex products ranging from Flexible Packaging, Geosynthetics, Instacool, Netlon Polymer Mesh & Insect Screen, Packaging Nets, Perimeter Fencing, Protective Sleeves and many more. Additionally, our range of products is highly acknowledged for its superior quality and high durability. Also, these products can be availed in various customizations as per client requirement. 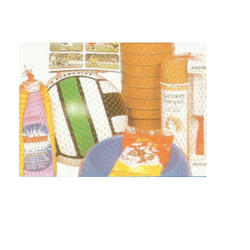 Our clients can avail these products at leading market prices. We welcome queries from Tamil Nadu including Chennai, Madras, Coimbatore, Kanyakumari, Nilgiris, Tirupur, Vellore, etc. Soil stabilisation, soil reinforcement for roads and highways, track bed stabilisation, mattresses and gabions for erosion control, river training and coastal protection, separation, filtration, reinforcement erosion control, paving fabric, etc. Ideal for roads, slopes and embankments. Our products can be used for waste management landfills, reservoirs, runways in airports, taxiways, warehouses, ports, patch repairs of roads for higher fatigue life. 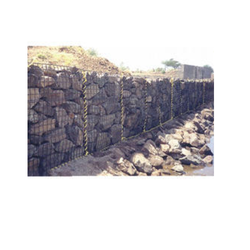 Tuflex geobags are used for coastal erosion control. 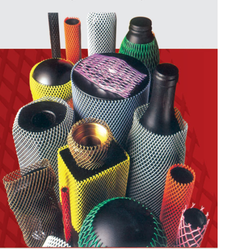 Today netlon india is acknowledged as pioneer and leader in the field of polymer mesh technology in india. Our meshes are non corrosive, acid resistant and all our meshes meant for outdoor use are uv stabilised, giving them a much longer lifespan even with protracted exposure to sunlight. 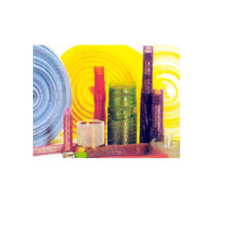 The products have a high tensile strength to match customer requirements. Get your family - good health and sound sleep. Get your home - the real protection from mosquitoes. The safest way to ban the entry to mosquitoes and avoids using harmful insecticides and chemicals in the form of mats, coils, vaporizers, emrs etc. They are harmful to the health of your family. Netlon insect screen is time tested, environment friendly and offers you 24 hrs protection from mosquitoes. Easy to install, non-corrosive and highly economical. It is absolutely safe for your family with no recurring costs. 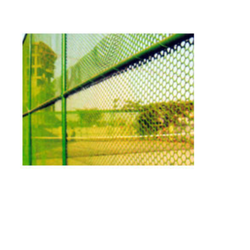 Before buying the netlon mesh & insect screen, look for the "tuflex" brand name printed on the edges of the net. This will ensure that you get the best value for your money. Tuflex india delivers reliable and cost effective solutions in packaging for products which need to be displayed or require ventilation. A wide range of packaging nets are available readily and we can develop one specially for your as well. Some standard products are given below. Tuflex fruit bags are a convenient and easy way of packing fruits, vegetables, mineral water bottles, toys, etc. Tuflex perimeter fencing can be used to construct a beautiful and safe enclosure for playgrounds, tennis courts and game areas for children. Prestigious hotels, clubs and sports complexes would find it an economical and aesthetic alternative to metal fencing that tends to corrode and requires constant painting and maintenance. Installation is easy. Just unwind the mesh and secure it to the support structure by using hooks, nuts & bolts. Tuflex india is engaged in offering protective sleeves made of specially engineered thermoplastic designed to give protection to components during manufacture, storage, transit and shop floor handling. They are used in protecting a large variety of tools and components like shafts, gears, pistons, precision bolts, threaded components, tubes, glass bottles, etc. These polymer sleeves are tough and flexible and offer superior performances. The sleeves are flexible and cling to any odd shaped surfaces and contours of the product. Being soft, they act as a cushion, thus ensuring complete protection. These protective sleeves come in different stretch and can be used for components with size ranging from 15mm to 180 mm diameter. Radium designer screen, in other words, beauty personified. Just as a feminine charm which adds a new dimension to a household, radium is sure to change the way your dream home looks. 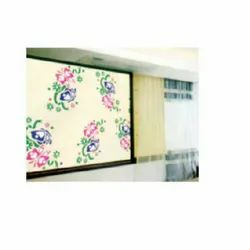 With carefully selected eye-pleasing designs and colours, radium screens are all set to capture the hearts of designers and homemakers alike. Like the protective nature of a mother who devotedly cares for her family, radium screen protects the entire family from pesky mosquitoes while ensuring an unobstructed flow of air. Tuflex instacool royale is a versatile instant shading gear to suit almost any application. The unique heavy duty knitting pattern of tuflex instacool is designed to drastically cut out the harsh sunlight and provide you with a cool and comfortable shade. The product is light weight but tough. Tuflex instacool is uv stabilized to perform against intense sun rays (containing uv radiation) for a minimum 3-year period and remains vibrant throughout its life. Tuflex instacool does not absorb any moisture and does not rot or smell. The product is washable by a spray of water. Tuflex instacool can be easily installed by the user without any professional assistance. 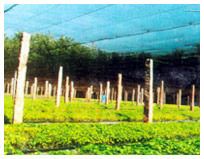 Rakshak” agro shading provides protection from the harsh rays of sunlight in the nurseries, green houses, shade houses, etc. It not only controls sunlight and temperature, but also reduces evaporation: minimizes wind hail and frost damages, mist rain; keeps our birds and insects and creates an ideal atmosphere that stimulates vigorous plant growth. 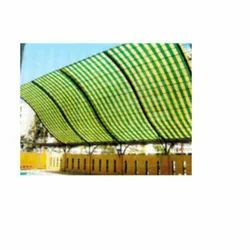 "Rakshak" agro shading is a tough, extremely durable, tear resistant and light weight, knitted fabric. This product is made out of 100% high density polyethylene of international quality and is uv stabilized for long life. ”Rakshak” agro shading finds wide spread applications in green houses, ploy houses, nurseries, shade houses, apple orchids, tea estates etc. It also performs the functions of an environment friendly garden fencing or sapling protector.